Invertigo Dance Theatre was recently named by Dance Spirit Magazine as one of the “top six trend-setting companies to watch in LA.” Founded by choreographer Laura Karlin, Invertigo uses dance to tell compelling stories and create deep connections with communities. One of the most fascinating aspects of Invertigo is that they perform with live musicians, and even use musicians who double as dancers in their productions. One of my goals with this show is to bridge boundaries and showcase a wide variety of musical styles and perspectives. As a musician, it’s easy to overlook the symbiotic relationship between music and the movement arts. To that end, I’m delighted to present this interview with Laura Karlin and my first inside look at the inner workings of a dance company, Invertigo Dance Theatre, with their innovative use of live music and musicians as integral components of their performances. Their upcoming production of “After It Happened”, a piece inspired by the aftermath of the Haiti Earthquake, and set to premiere at the Ford Theater in Los Angeles this Friday, Sept. 30. Film and television composer Gary Lionelli created the music for ESPN’s critically acclaimed five-part miniseries “O.J. : Made in America,” directed by Ezra Edelman. In addition, he has provided music for Rory Kennedy’s 2015 Academy Award nominated film “Last Days in Vietnam” and HBO’s dramatic series “LUCK,” starring Dustin Hoffman. Most television projects for composers involve providing music for 30-60 minutes of show time. Most movie projects call for music for 1.5-2 hours. But what if you were approached to write music for a massive 7.5 hour movie, and given only 3 months to do so? That’s what composer Gary Lionelli faced when he was called on to provide music for the massive ESPN mini-series, “O.J. : Made in America”, a project that has the unique distinction of being eligible to win both television Emmy and film Oscar awards. Anthony McGill is one of the greatest clarinetists in the classical music field today. He’s been the Associate Principal Clarinet of the Cincinnati Symphony Orchestra, the Principal Clarinet of the Metropolitan Orchestra, and currently serves as Principal Clarinet of the New York Philharmonic. Several months ago, Anthony’s older brother, Demarre McGill, was featured on the show. What an honor to have the opportunity to talk to Anthony, whom I’ve known since he was a student at Curtis. In addition to his remarkable achievements in the orchestral world and collaborations with some of the greatest classical musicians, Anthony performed with Itzhak Perlman, Yo-Yo Ma and Gabriela Montero at the inauguration of President Barack Obama back in 2009. On a tangential note, Anthony was actually partially responsible for inspiring me to become a paperless musician, and start a little company called “AirTurn” to create wireless page turning pedals for reading digital sheet music hands free. Welcome to A Musical Life. 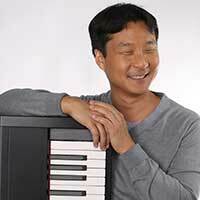 I’m Hugh Sung, host and executive producer of the show. Due to my teaching and performance schedule this summer, we’ll be taking a short summer hiatus. But don’t worry! We’ll be back in just a few weeks. I’ll be the Piano Director at the Philadelphia International Music Festival for the next two weeks. Check out my interview with PIMF Director and co-founder Sandy Marcucci. After that, I will be performing with the Baltimore Symphony Orchestra as part of their summer concert series. After that, I will be in L.A. for a one-week business trip. To be notified as soon as the episodes resume, visit https://www.amusicallife.com to sign up for our newsletter. Thank you for your support! I wish you a restful summer and A Musical Life! “Clair de lune” by late 19th and early 20th century French composer Claude Debussy is one of the world’s most beloved pieces written for the piano. In this special episode of “A Musical Life”, I’ve invited award-winning pianist, composer, and Peabody Conservatory graduate Jennifer Nicole Campbell to share her insights into what makes “Clair de lune” such a special musical experience. On this show, we share stories about making music and the things that move our souls. Up to this point, these stories have been centered around musicians and composers living remarkable lives and creating incredible musical experiences. For this episode, I thought we’d try something a little different. Music is a fascinating language, and even when there aren’t any words being sung, you can definitely sense an atmosphere, characters, and a narrative arc being created through the collage of sounds, silence, and time. But like any language, it really helps when you understand the syntax and meaning to fully appreciate and enjoy the poetry of sound we call music. To that end, I’m delighted to introduce you to today’s guest artist and music “translator”. Jennifer Nicole Campbell is a remarkable young pianist, composer and educator who recently launched a new series of videos called, “Music Musings”. Her first episode tells the musical story of “Clair de lune”, by Claude Debussy. She did such a wonderful job explaining the inner workings of this popular piece that I invited her to be a guest contributor for the show. Norman Lebrecht is one of the foremost cultural writers and classical music reviewers today. In addition to his columns for The Daily Telegraph and The Standpoint, he’s been a host on BBC 3 Radio, and his first novel, “The Song of Names”, is in the process of being adapted into a major motion picture. Norman has written extensively on the business side of classical music, and his website, Slipped Disc, is one of the most widely read resources for classical music and art news. Journalist, writer, novelist, broadcaster, lecturer – Norman Lebrecht is easily one of the most prolific commentators on culture and the classical music arts. In addition to all his accomplishments and 12 books under his belt, Norman is an expert on the music of the 19th century Austrian-Jewish composer and conductor Gustav Mahler. I think you’re going to really enjoy this fascinating conversation with a man who has spent his life exploring the meaning and message found in classical music. Pieter Schlosser is an award-winning film, television and video game composer known for his work on NBC’s hit show “You, Me And The Apocalypse”, as well as his collaborations with Steve Jablonsky on “Desperate Housewives”, the Transformers film, and Gears of War 2 & 3 video games. As a multi-cultural multi-instrumentalist, Pieter draws on an incredible reservoir of creativity and artistic versatility. I really love these shows where we get to talk to amazing composers and explore the creative process and inspirations behind their work. Pieter Schlosser is one of those musicians that needs the prefix “multi” in front of their name – multi-linguist, multi-genre, multi-talented. And a great suffix for him would probably be, “go-getter” – time and time again, Pieter’s initiative has served him well, putting him in the company of great film composers like Hans Zimmer and opening some incredible opportunities in film, TV, and video games. Violinist, scholar, composer, philanthropist, and heavy metal shredder Rachel Barton Pine is a one-of-a kind musical tour de force, connecting a wide array of cultures, genres, and communities. Despite tremendous childhood difficulties and a major setback early in her career, Rachel drew upon a profound spiritual resource to become one of today’s leading musicians and an inspiration to so many worldwide. Rachel Barton Pine is, quite simply, one of the most extraordinary musicians I’ve had the honor to feature on the show. As a violinist, she has recorded nearly 30 albums and performed with major symphony orchestras and conductors worldwide. As a scholar, she has championed the music of black composers and pioneering women. On top of that, she has the distinction of being the first living and first female composer to have her violin cadenzas, encores, and arrangements of works for violin and piano published by Carl Fischer Music as part of its Masters Collection. Her musical styles cover the gamut between baroque and contemporary classical composers, and wait until you hear about her passion for heavy metal! Her latest album, Testament, was recorded at her home church in Chicago where she fell in love with the violin and the music of Bach as a child, and was recently the best selling classical album. Jason Graves is a BAFTA award-winning composer behind some of the most popular video games such as the Dead Space series, the 2013 reboot of Tomb Raider, and more recently Far Cry Primal, which was just published by Ubisoft earlier this year. Jason combines modern classical composition techniques with innovative sound designs to create scores that are incredibly visceral and immersive. Video games are a 101 billion dollar industry worldwide. To put this into perspective, the video game industry by some estimates is twice as large as the movie industry. As games become more and more immersive with photorealistic graphics and compelling storylines, high production quality demands a great music score. This is where my guest Jason Graves comes in. A classically- trained composer and world percussionist, Jason has written music for film, TV, and nearly 80 games, and has won BAFTA awards and nominations for his work on the Dead Space and Tomb Raider games. For his work on Far Cry Primal, a game set in the stone age, Jason created an entirely organic score, blending sounds created from natural materials, such as wood, bushes, bones, antlers, clay pots, as well as a ram’s horn, wooden flutes, female vocals, and an instrument called an Aztec Death Whistle. World renowned cellist Yo-Yo Ma established Silkroad in 1998 to explore how music can advance global understanding. Since 2000, the musicians of the world music collective, Silk Road Ensemble, have been on a mission to change the world by connecting diverse cultures and traditions in performances, workshops, and residencies. Yo-Yo Ma and the Grammy-nominated Silk Road Ensemble recently released their sixth album, “Sing Me Home”, which was developed and recorded alongside “The Music of Strangers”, a new documentary movie from Oscar® and Emmy-winning director Morgan Neville that tells the story of the Ensemble and Silkroad, its parent organization. “The Music of Strangers” is slated for theatrical release later this week, and is one of the most breathtaking, beautiful, and moving documentaries I have ever seen. In this episode, we’ll meet some of the remarkable musicians featured prominently in the film, and listen to excerpts from “Sing Me Home”, an album which explores the musical roots of individual members of the Ensemble.